Termination of VoIP traffic in Uganda can get you high profits - over $250 per channel. At $0.1 per minute, there are inexpensive tariffs for local calls in Uganda. The mobile sector is well developed: with a population of 41.5 million people, penetration of cellular communications has reached 55%. To get an impressive profit on call termination, it is important to choose a large operator’s profitable tariff plan. Airtel is the second cellular company in Uganda in terms of covering the market. Its subscriber base has more than 8 million users. Airtel is MTN's largest competitor since it entered the Uganda market in 2013. The operator provides good 2G and 3G coverage across the country, as well as tests the 4G generation networks. Weekly Kyabise Combo. Provides 300 bonus minutes for $2.78. Forever Bonus. The subscriber is given bonuses every time he does top-ups. If you replenish your account for more than $5, the bonus will be 50%. With $14 topped up, the money on the account is doubled. 3 shilling. 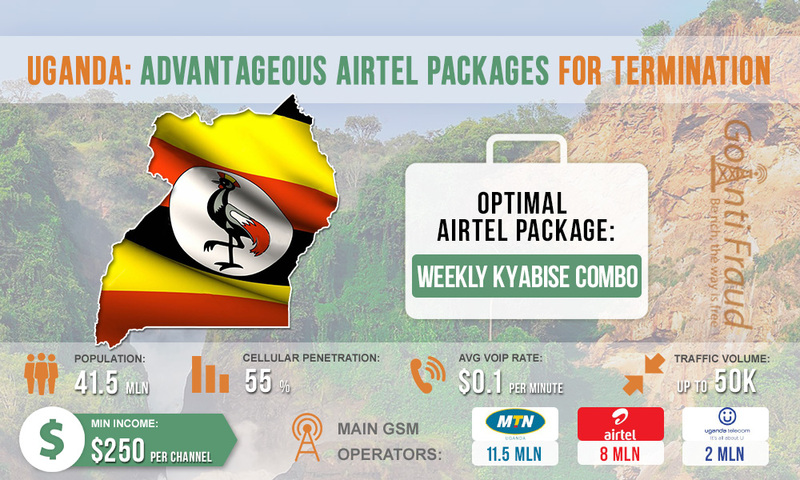 Using this tariff plan, the second of the conversation will cost the subscriber as little as 3 Ugandan shillings ($0.00083). That is, one minute of the call will cost $0.04. The most suitable package for termination via a voip sim gateway is Weekly Kyabise Comb. Using this tariff plan, one minute of conversation will cost as little as $0.009. When you have your equipment operating for 5 hours a day, you can make about 500 dollars via one channel.